The members of the Polar Odyssey sailing club have made it around the world on numerous occasions with their frigates, schooners, lodyas and kochs - even hosting former Russian President Boris Yeltsin aboard. For centuries, the coast dwellers from Karelia and Arkhangelsk were the masters of the seas – intrepid travelers that navigated uncharted waters to discover new shores. Yet, their achievements have since been mostly forgotten, lost to all but historians and boat enthusiasts. It is these enthusiasts who now try to keep the glory days alive: they reconstruct historic ships based on old drawings and descriptions, and then test them out on the water, following in the footsteps of their predecessors. “Navigare necesse est” – “It is necessary to sail.” The Polar Odyssey sailing club from Petrozavodsk has been following this ancient mariners’ motto for 32 years now. Here, they build exact replicas of historic ships - to date, more than 30 schooners, kochs, frigates and old Slavonic sailing boats. With the firm hand of the club’s founder and president, Victor Dmitriev, at the helm, Polar Odyssey ships have sailed no fewer than two dozen seas and three oceans. In 1978, Victor, who was a senior researcher at a machine building institute at the time, managed to get his hands on an old boat with a 20 horsepower engine. The newly christened Polar Odyssey then took the captain, his family and three student sailors on their first voyage, from Petrozavodsk to Leningrad. 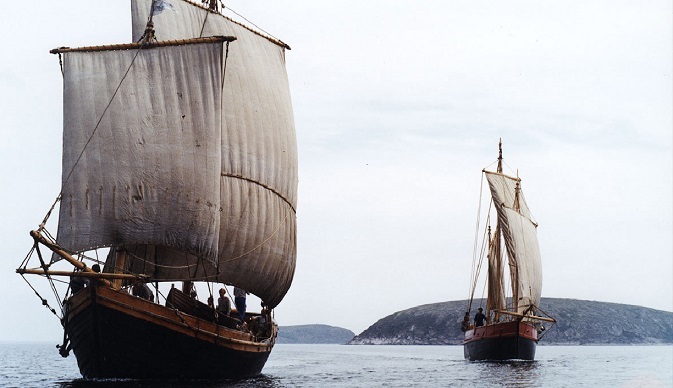 During the trip, Victor became convinced of the fact that the seafaring traditions were dying out, and swore to dedicate his life to the reconstruction of historic ships. So he set about getting a team of expert engineers and workers together (the club now has its own design bureau). In 1987, the club finished its first reconstruction project – the kochPomor – a boat powered manually with oars and a sail. The Pomor has traveled the northern sea routes, visited the shores of Scandinavia and even made it to Canada and Alaska. The dock masters at the Petrozavodsk Maritime Historical and Cultural Center are currently busy building new ships – a ‘lodya’ (an old Slavonic sailing boat like a Viking ship) and some kochs. The newly built koch boat differs from its predecessors in that it has a motor – just in case it is needed. Eight people can just about squeeze into the cabin, with another four on deck. It took the shipbuilders just three months to put the ship together; it took slightly longer for the lodya. “Right now, we’re working on a prototype for a drifting station,” Victor says. Victor revealed that the club turns into a yacht marina in the summer. “Yachting isn’t particularly popular in Russia. A lot of people don’t even know what it is: they think it’s something that is ridiculously expensive, something for the likes of Mr. Abramovich. But that’s not the case. The word ‘yachting’ actually comes from the Dutch and means ‘a boat for recreation’ – and that could mean anything from these gigantic yachts you see oligarchs in to tiny little boats,” he says. The Polar Odyssey Maritime Museum resembles a big cabin, with brigantine sails on the table and ropes hanging from poles. The walls are adorned with stands, each of which is dedicated to a particular voyage: the Northern Sea routes and the Mediterranean; the journeys to Svalbard, Canada and Alaska. There are maps, photos of sailors and people from distant lands, old navigational equipment and pieces of wrecked ships – the living and growing history of the Polar Odyssey. In July 1997, Yeltsin took a tour aboard the St. Nicholas (a replica of a 17th-century trading boat) during a trip to Kizhi. The boat traveled to the local skerries, and the president did not move from the deck, attaching worms to the fish hook so his security guard could catch perches. They managed to catch about a dozen small ones. Tourists to Karelia have two enemies – mosquitoes and ticks. “You don't get either of them on water,” says Victor. “But, strange as it may seem, the fleet disappears when we get to Lake Onega and Lake Ladoga. The Comet hydrofoil only goes to Kizhi. But there a loads of islands on Karelia’s lakes that are inaccessible for tourists right now. When small ships start appearing that you can rent out... Just think – a floating summer house. Take a load off, live life, sail!